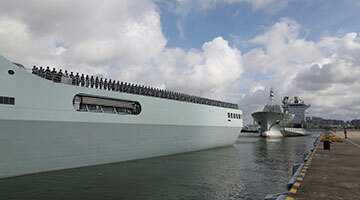 ZHANJIANG, Guangdong, July 11 (Xinhua) -- Ships carrying Chinese military personnel departed Zhanjiang in southern China's Guangdong Province on Tuesday to set up a support base in Djibouti. Shen Jinlong, commander of the People's Liberation Army (PLA) Navy, read an order on constructing the base in Djibouti, and conferred military flag on the fleets. The establishment of the PLA Djibouti base was a decision made by the two countries after friendly negotiations, and accords with the common interest of the people from both sides, according to the PLA navy. The base will ensure China's performance of missions, such as escorting, peace-keeping and humanitarian aid in Africa and west Asia. The base will also be conducive to overseas tasks including military cooperation, joint exercises, evacuating and protecting overseas Chinese and emergency rescue, as well as jointly maintaining security of international strategic seaways.